Elizabeth Lissaman: New Zealand's Pioneer Studio Potter traces the life and works of New Zealand's pioneering woman studio potter. It is fully illustrated with over 100 of Lissaman's pottery selected from private and public collections. Illustrations also include images of her de... read full description below. Elizabeth Lissaman: New Zealand's Pioneer Studio Potter traces the life and works of New Zealand's pioneering woman studio potter. It is fully illustrated with over 100 images, especially photographed, of Lissaman's pottery selected from private and public collections. Illustrations also include images of her designs and historical family photographs. The biography is meticulously researched and written by Jane Vial, and Steve Austin contributes an essay placing her work in the wider international contexts of art deco and decorative modernism, as well as the history of women's art and social standing in early 20th century New Zealand. Together, this book is a definitive biography and art history of arguably the first independent, professional studio potter in New Zealand. Lissaman designed, threw, decorated, fired and sold her first significant collection of pots in 1927 and potted continuously for almost 70 years until 1990, spanning New Zealand's studio pottery movements. She is also known for her accessible practical textbook Pottery for Pleasure in Australia and New Zealand first published in 1969 and reprinted five times, with editions sold in the UK, Australia, Spain and the Americas. This book will position Elizabeth Lissaman as a commercially successful and significant studio potter and teacher from the 1920s to the 1980s who adapted to the times, creating fine examples of indigenous New Zealand Art Deco `art pottery', as well as Mid-Century Modern pottery. It provides breadth to the assessment of New Zealand ceramics which, until now, principally focused on the achievements of post-war studio Anglo-Japanese stoneware studio potters. 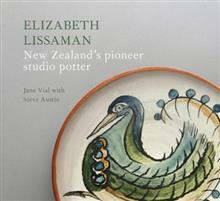 By careful interpretation of Elizabeth Lissaman's extensive personal archive including her account books spanning sixty years, this book redefines what constitutes a successful twentieth-century studio potter in New Zealand. While Lissaman was developing a body of work from 1920, it was the same year that Bernard Leach and Shoji Hamada founded Leach Pottery in St Ives, Cornwall as basis for Anglo-Oriental work. Fuelled by a modern education emphasising individual creativity, Lissaman developed her own practice within the isolation of the Antipodes. Seeking international models, she travelled to Sydney in 1923, then a dynamic metropolitan city where European modernism and the latest contemporary decorative arts were manifest. The book focuses on the originality of her pathway to her pottery practice, her designs deriving from sources including Aegean, Mediterranean, Australian and British pottery. Her systematic approach to gaining knowledge of New Zealand clays and her successful sales and connections to art and craft outlets throughout New Zealand were her own unique routes to a successful career. This book focuses on a woman artist, starting in the 1920s, whose practice remained regional rather than in main centres throughout her career. Her original motivation was borne of international ideas and aspirations yet which manifested effectively in Antipodean isolation. Scrutiny of her career and works feed into an original study of local art and cultural history in defining identity, especially women artists' contributions to the field. The book will be published in partnership with Marlborough Museum - where the largest public Lissaman ceramic collection is housed. It intends to develop the collection as a permanent attraction for visitors, as Lissaman spent her first thirty years in the area. Jane Vial is a consultant art historian living in Blenheim. She studied at Canterbury and Victoria Universities and graduated with a MA in art history. She has contributed to publications including Art at Te Papa (2009), Te Papa Press and Paul Dibble, David Bateman (2001 & 2006). Exhibitions and catalogues include From fretful sleeper to art world giant: The gallery of Helen Hitchings, Museum of Wellington (2008), Bohemians of the brush: Pumpkin Cottage impressionists, winner of the 2011 Museums Aotearoa award for Exhibition Excellence in a Small Museum, (Expressions, Upper Hutt, 2010) and Te Ru, movers & shakers: Early New Zealand portraits by William Beetham, New Zealand Portrait Gallery, 2013). She has lectured for the New Zealand and Australian Decorative and Fine Arts Societies.